Wintertime at Yellowstone National Park is a magical experience. This snowy season opens up many new possibilities for adventure and exploration. Two quality lodges are open at the park in the winter. The Old Faithful Snow Lodge & Cabins and Mammoth Hot Springs Hotel both have terrific winter packages, combining recreation with outstanding accommodations and amenities. Each lodge provides unique winter options designed for visitors who love the outdoors. There are interpretive sightseeing tours, equipment rentals, lessons, and rejuvenating services offered at both locations. There are two local roads plowed and open to automobiles in the winter. The only road leading into Yellowstone National Park is State Route 212 from the north entrance leading through the Mammoth Hot Springs area out to the northeast entrance and Cooke City, Montana. Over-snow vehicles are required to get beyond Cooke City. Also, the section of Highway 191 passing along the west side of the park is open to vehicles, but there is no entrance access. These roads close temporarily in extreme weather conditions. Snow tires or chains may be required in certain areas. 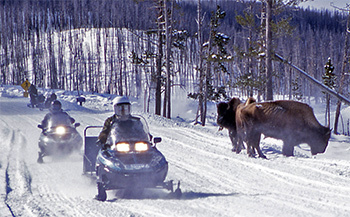 Over-snow vehicles, such as snowmobiles and snowcoaches are used to travel through the rest of the park. In order to get around the park and to Old Faithful Snow Lodge, there are frequent snowcoaches from the north, west, and south entrances. Reservations can be made in advance to ensure transportation from these entrances. Snowmobiles are another option in the park, but must be accompanied by a guide. There is a variety of winter luxuries at the award-winning Old Faithful Snow Lodge & Cabins in Yellowstone National Park. This lodge is open mid-December through mid-March. The lodge and guest rooms are decorated with log construction and creative wildlife adornments. In the winter, the only way to travel inside the park is by snowcoach or snowmobile. Most people take these over-snow vehicles from the north, west, or south entrances into Yellowstone National Park. 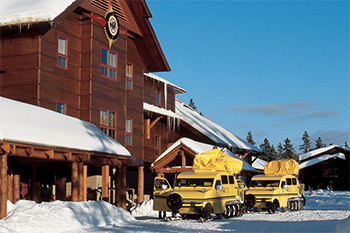 The Old Faithful Snow Lodge & Cabins provides snowcoach transportation making it easy to get from outside the park to the lodge. The rustic western-style Old Faithful Snow Lodge has a family-style dining room, the Geyser Grill, and the Bear Den Gift Store with unique souvenirs. They offer a variety of winter activities and sightseeing adventures. This hotel is named after the enchanting and colorful Mammoth Hot Springs. The steaming springs and its limestone terraces are one of the most popular park destinations, situated right beyond the hotel. 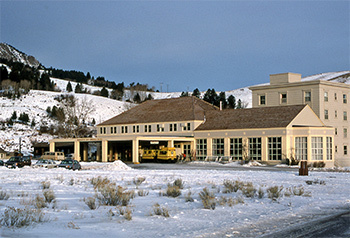 Mammoth Hot Springs Hotel is open to the public for the winter December to March. It is the only facility accessible from the road near the north park entrance during this season. They offer Nordic Skiing, snowshoe rentals, and ice skating. There are also a variety of interpretive nature tours to key locations inside Yellowstone National Park. Daily round-trip snowcoach transportation is available through the reservation office. These snowcoach tours take guests to and from main locations including Mammoth, Old Faithful, Flagg Ranch, and West Yellowstone. The shuttle trips are designed to get visitors around the park and to the hotel, with brief sightseeing stops along the way. Mammoth Hot Springs Hotel has a full-service dining room, espresso service and a lounge, and an elegant Map Room to read and relax in. There is also a general store, service station, and medical clinic conveniently located nearby.